From December 2012 to June 2013. 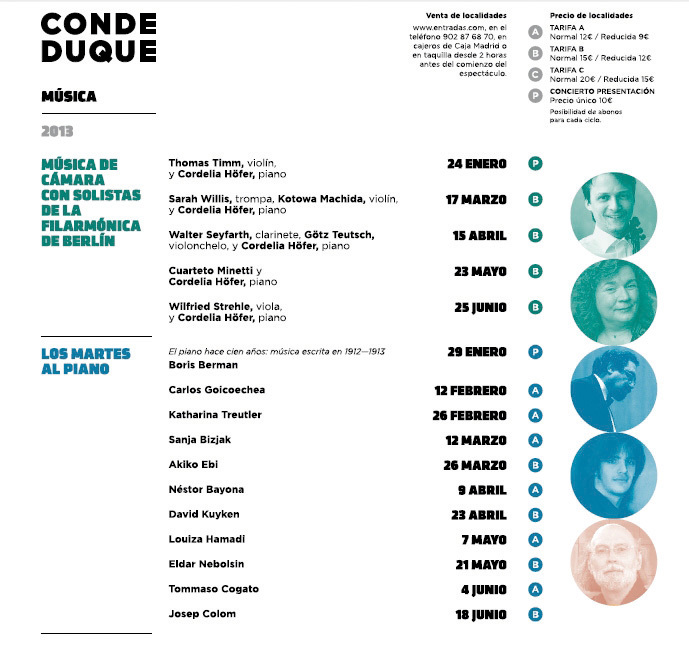 Throughout the 2012/2013 season the Davidsbuendler Association worked closely with the “Conde Duque” Auditorium in Madrid, one of the most revered chamber music halls in this city. For this collaboration, Davidsbuendler offered the artistic direction, the coordination and co-production of two concert series, being “Los Martes al Piano” strictly linked to the Program of Support for Young Concert Pianists previously mentioned. Thanks to this program, two piano recitals were held monthly, these being performed by Guest Professors of this program and the young scholarship holders, who also had the opportunity of taking part in this series, offering recitals of their own. This series also included two previous concerts and a Music Marathon Day with the participation of numerous young musicians for the International Day of Music (June 21st). 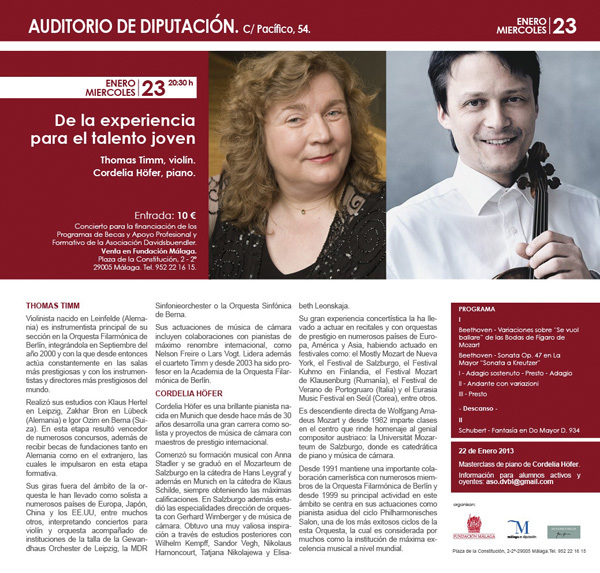 Davidsbuendler’s collaboration with the Auditorio Conde Duque in Madrid also offered a specific concert series aimed for chamber music performances with the exceptional participation of members from the Berlin Philharmonic Orchestra and its pianist in residence Cordelia Höfer (who also provided highly valuable assistance for the coordination of this series). Through monthly recitals, and an extra concert held in Málaga, we had the honour of bringing to Spain numerous musicians both from the string and the wind sections of this orchestra, which is considered one of the most revered musical institutions worldwide.